...when I see how long it has been since last I posted here. The fact is, while we've been having a wonderful time here in England, I have a hard time supposing it's anything anybody really would be all that interested in reading. Mostly we have been enjoying our friends here. We have been living here as distinct from touring here. Demetrios has been working very hard on his book. Until now, his ideas on his subject matter have kept undergoing rather drastic revisions, as each new insight casts all the previous ones in a new light. Now he thinks (and for whatever it's worth, I agree) that he has formulated his understandings of the human mind and of its relationship to the brain in its simplest, most elegant form possible. At last, after years, the writing is flowing more or less fluently. But that has kept him very busy. 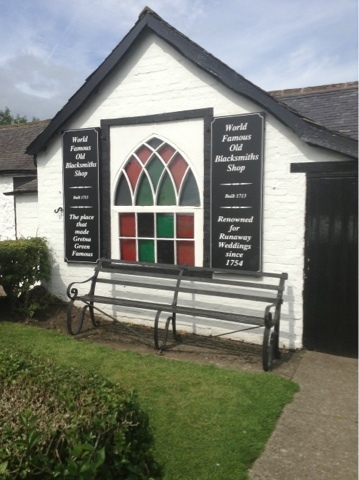 We have had a day trip into Scotland, where we visited the famous wedding spot for runaway couples in Gretna Green. Weddings there these days are not usually elopements, as they used to be in days when Scottish marriage law was so much more liberal than English. 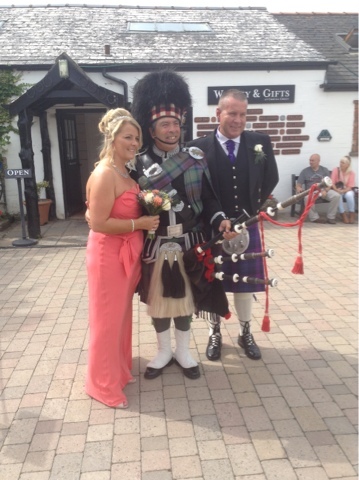 Three weddings took place while we were there, complete with bagpipes. 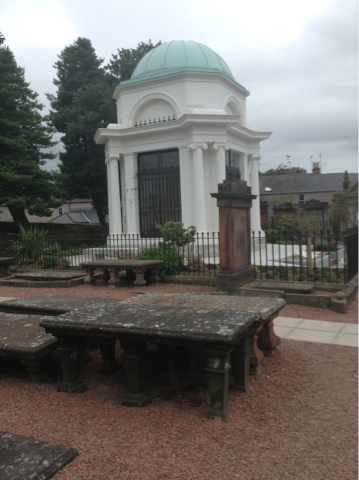 From Gretna, just inside the border, we went on to Dumfries, where we visited the home as well as the grave of Robert Burns. Then, as the trip had been unplanned, and only decided upon when we were already halfway to Scotland, we turned back and came home. In between our busy social calendar, I've begun a shawl in this stitch, but in white. It looks good on the other side, too.